By the Late Bronze Age, the Eastern Mediterranean was at the center of the some of the most advanced civilizations of the world. In Egypt, the New Kingdom was at its height, in Anatolia, the Hittites had carved out a vast empire, in the Levant, the Canaanite coastal cities were prospering through trade from Egypt to Mesopotamia, and in the Aegean, the Mycenaean culture was flourishing. Starting at around 1250 BC however, the Eastern Mediterranean was rocked by wave after wave of invasions. In the Aegean, the Dorian Invasion effectively brought an end to Mycenaean civilization. Slightly later, the Near East was also invaded by what the Egyptians called “the Sea Peoples”. There are a number of theories on who the Sea Peoples were: that they were refugees from the Dorian invasion of the Aegean; that they were escaping famine in Anatolia; or even that they came from the Western Mediterranean. Whatever their origins, the “Sea Peoples” had a major impact on Mediterranean History. 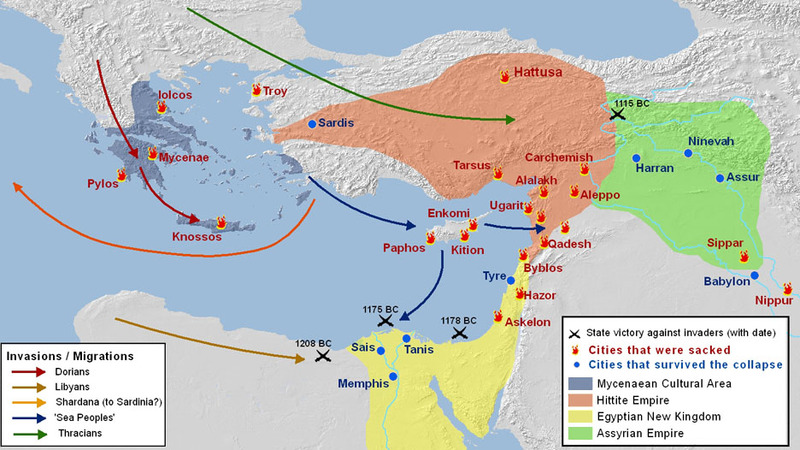 According to Woudhuizen, the invasion of the Sea Peoples effectively shifted the economic and political centre of gravity of the Mediterranean world away from the Near East and towards the Central Mediterranean.